Apple © enthusiasts (and anyone else developing on any Apple platform) will be happy to discover that Artifactory is a fully fledged CocoaPods repository. Using the Artifactory CocoaPods plugin, you can transparently provision dependencies to the pod command-line tool from local or remote repositories. Artifactory calculates metadata for pods hosted in local repositories and is a proxy for remote CocoaPods spec repositories and Git repositories containing pods. Using local CocoaPods repositories, Artifactory gives you a central location to store your internal CocoaPods packages. When all teams know that any package can be accessed from a single URL, access to local packages and managing them between the different teams becomes very easy. And if you need to share your packages with colleagues in geographically remote sites, Artifactory supports replication to another instance of Artifactory that is outside of your local network. Alternatively, Artifactory in a distant location can manage a remote repository to be a proxy for your local CocoaPods repository. 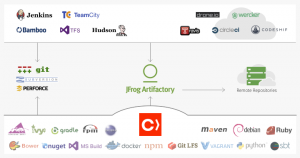 With Artifactory as your CocoaPods repository, all the resources you need for development and build are stored on your own local or corporate network and storage. Packages developed internally are deployed to local repositories, while external resources, such as the GitHub CocoaPods spec repository, and GitHub repositories containing pods, are proxied by Artifactory, which caches packages from the remote resource locally. Effectively, all packages you need for your development effort are available on your local network, independent of the external network or any 3rd party services. Artifactory provides you with flexible search capabilities to help you find any CocoaPods packages stored in your system using both the Artifactory UI and the REST API. Built-in functions make common searches very simple. Custom properties take search a step further. Artifactory lets you assign any set of properties to your pods, which can later be used for search. Custom properties let you search for packages using any set of rules relevant to your workflow. But the full power of search comes with AQL, which allows you to search for packages using any number and combination of search criteria. A simple way to construct complex queries.